There are a number of alternative aftermarket kits to improve the gear change quality and speed of your car's gear change. These range from a rebuilt standard gear lever mechanism - which is the quick-shift system available from Tech-speed motorsport, through to remanufactured kits, such as the Slick Shift available from Mike Satur. Moss Europe: The Moss kit comprises of a new gear selector lever, attractively chromed, that replaces the original longer item. The kit helps shorten the throw of the lever, but on the example I tried, the mechanism was very loose - and probably needed tightening up using the instructions mentioned below! Mike Satur: Mike Satur's kit is the most comprehensively re-engineered kit available on the market - replacing the whole lever assembly with milled alloy components. It provides a pleasing rifle-bolt like action, but on some examples I've tried, can be somewhat notchy. Brown and Gammons: I am not completely sure on the detail of the B&G kit, but appears to be very similar to Mike Satur's - and knowing that the two companies often collaborate with their product lines, I wouldn't be surprised to find that they are in fact the same. Which means the same high quality gear shift - but do check on details if considering purchase. The cars equipped with the best gear change quality are those vehicles where the gear lever sprouts almost directly from the gearbox itself – and this is fine if the car in question has the engine in the front, driving the rear wheels, and the gearbox can be found nestling between you and your passenger. On an MGF and MGTF however, the engine (in Pantomime stylee) is behind you. And so too, unsurprisingly, is the gearbox. Which means that there needs to be some kind of linkage between the gear lever and the gear box. On our MGs, this is achieved using a remote cable arrangement – and pleasingly, this works remarkably smoothly given that the cables are over a metre long and have a convoluted route to take to reach the gearbox itself. Good, but perhaps not perfect. And over time, the gear change can get progressively sloppier to the extent that the counter weight at the other end of the gearlever can crash into the sides of the centre tunnel when moving the gear selector across the grate. On my Project MGF, Project Shed, this was certainly the case. The gear selector had been salvaged from a car with over 100,000 miles showing on the clock – so some wear is probably to be expected. But the gear-change quality was simply unacceptable, and would undoubtably lead to missed gear selections when used in anger on track. Plus the lever was awfully long – which seems to exacerbate free movement. The question is, can this be rectified on a DIY basis? There are three “quick shift” solutions available – typified by the kits sold by Moss Europe, Tech-speed motorsport and Mike Satur. But each of these options, although certainly worthy, are not all that cheap – but the kits from Moss, B&G and Mike Satur are available for DIY fitment (see side bar). I'll not go into much more detail on this here, but there are articles on the web where people have fitted these and posted their own opinions. 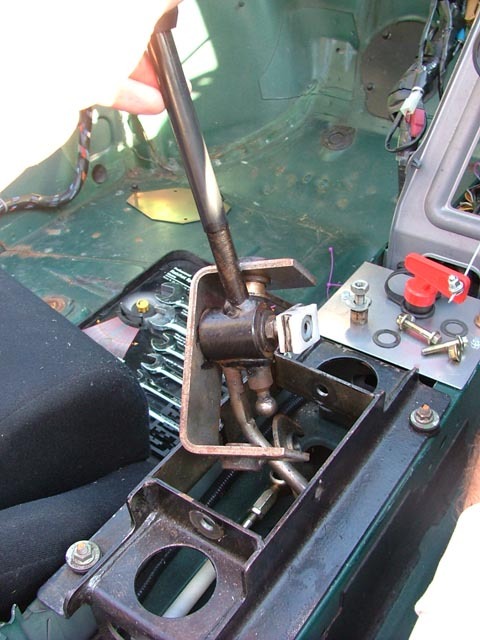 This very neat write up showed how to tighten up the yokes of the gear lever selector gimbal to eliminate play and improve the preciseness of the gear change. The clever thing is the demonstration on how to do this without removing the interior trim, and is certainly worth a read. 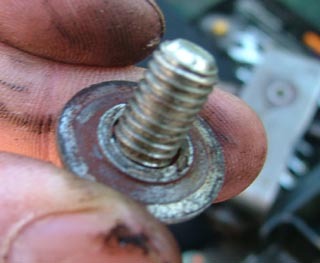 However, on Project Shed, tightening these bolts had no impact whatsoever on the gear shift quality. The good news was that the Shed does not have any interior trim, so I decided to strip the gear lever/selector assembly down and see what could be done. As it turns out, replacing one washer had a tremendous impact and restored the shift quality to as-new. Here’s how I did it. 1. There are two options here - either remove most of the interior trim (which is what I have done for Project Shed), or just remove the centre console/ dash - as this should reveal enough of gear lever mechanism for you to work on (although I am not 100% sure, as I have not tried doing it this way). If removing seats, you’ll need to disconnect the SRS airbag system – so for safety, disconnect the battery 30 minutes before starting work. Make sure you have all necessary codes to reactivate your stereo before hand though. 2. 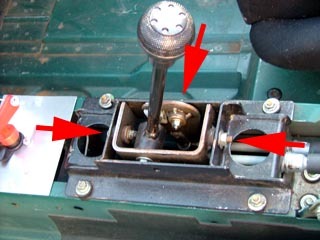 If removing the centre console only, follow instructions here on how to do this, and jump to (5). 5. Now the gear lever selector assembly is exposed to work on. 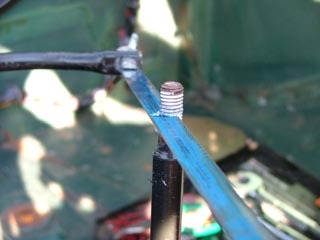 First, as suggested by PQD44 in his T-bar forum post, tighten up the three outer gimbal bolts (arrowed in image left). This may be sufficient to tighten up the gear change quality. 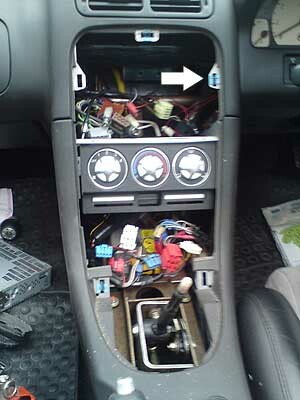 If only the centre dash section has been removed, then the rear most bolt is probably best accessed via removing the ash tray, or from the central oddment box (liner pulls out easily). 6. 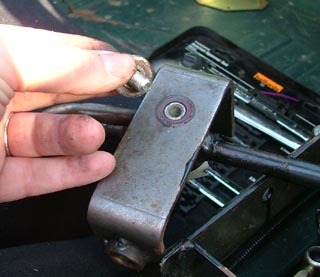 If however tightening the bolts alone is insufficient (as it was in my case), work your way round and remove each in turn – making careful note of assembly order of bolts/washers. 7. 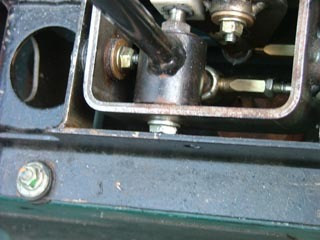 Now remove the lever pivot bolt from the central yoke. 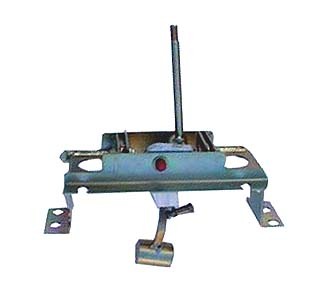 You will need to disconnect the cable – it’s a ball and cup joint, and the two will separate with gentle levering. 8. Inspect the components – you may find that the thrust washer has become heavily worn – as was the case on my gear lever – and is responsible for much of the slack and lost motion. 9. This is the easiest point at which to shorten the gear lever should you wish – as you can take it to a work bench and cut down with a junior hack saw in the comfort of your workshop (garage/ kitchen/ pavement of road outside etc). 10. Reassemble with a replacement washer. Re-grease pivots as you go. 11. 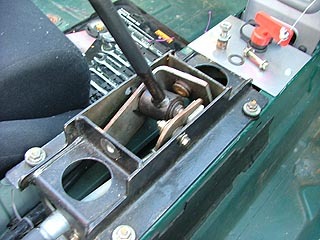 Reconnect the cable and complete reassembly of the gear lever mechanism. Check change quality – and marvel at your handy work! 12. Reassemble interior trim in true Hayne’s manual style.